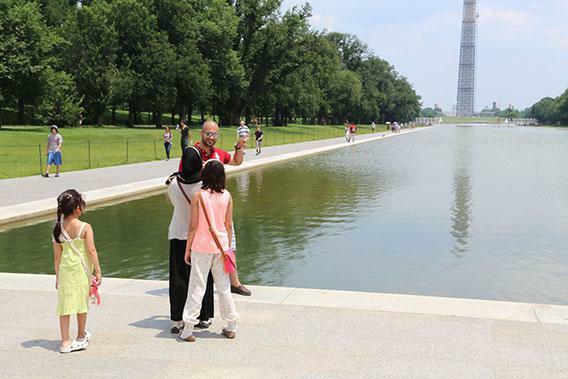 Tourism Washington D.C.: Photos of visitors with their technology gadgets. Why Do People Visit Washington, D.C.? Today’s tourists are buried in their technology. Washington, D.C., is in the heat of tourist season. The Metro is packed with bored children whose dads are enthusiastically preparing them for the wonders of the National Museum of American History’s Conestoga wagon exhibition. Tourists idle on the left side of the escalator, one hand on a fanny pack-laden hip. They Instagram pictures of lunch at Shake Shack. They are easy to spot: their uniform characterized by red, white, and blue paraphernalia, or I ♥ DC T-shirts; they wear baseball caps, visors, white tennis shoes, and plenty of sunscreen. They carry massive DSLR cameras set to automatic mode and navigate the National Mall with Google Maps on their iPads. 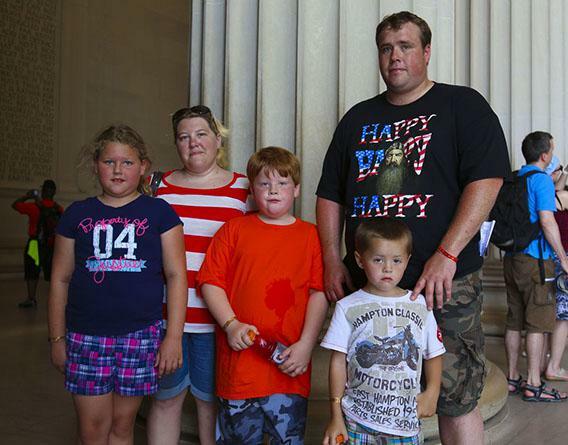 A tourist family poses for an iPhone photoshoot beneath the Lincoln Memorial. Natives of the district get frustrated with tourists. While visitors know our city only from C-SPAN and Meet the Press, from Homeland and House of Cards, we know its real face. We are calm and efficient in our daily commutes, while they need five tries to put their Metro farecard through the machine in the proper direction. They block sidewalk traffic in slow-moving packs of four across. And yet, all of these annoyances aside, we know our city is rich in national history. Many of us were tourists, too, once. I set out to capture images of this familiar beast, to find beauty in our favorite annoyance, and to understand what draws them to the district. 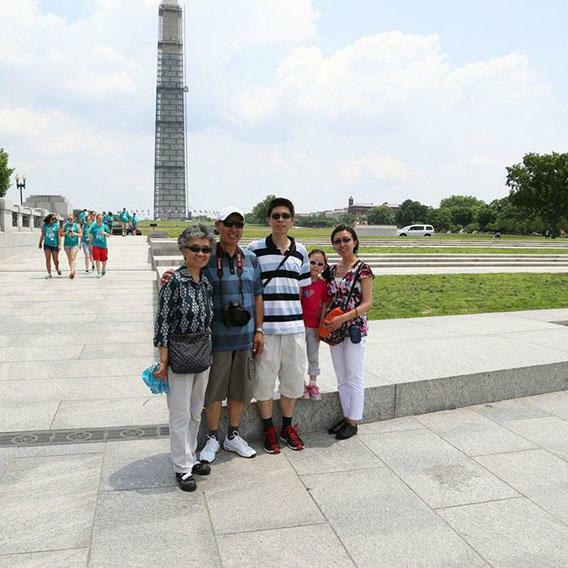 A visiting family from Japan posing at the World War II memorial. When I was a little tourist, first seeing the highlights of my greater hometown (having grown up in just north of the city in Maryland), my family brought along a chunky, 5-pound digital camera so that my mom could make a Creative Memories scrapbook cataloging our trip. These days, tourists are instantly storing memories on their iPhones. Though I should have seen it coming, I was shocked at the degree to which modern technology and social media had invaded the National Mall. 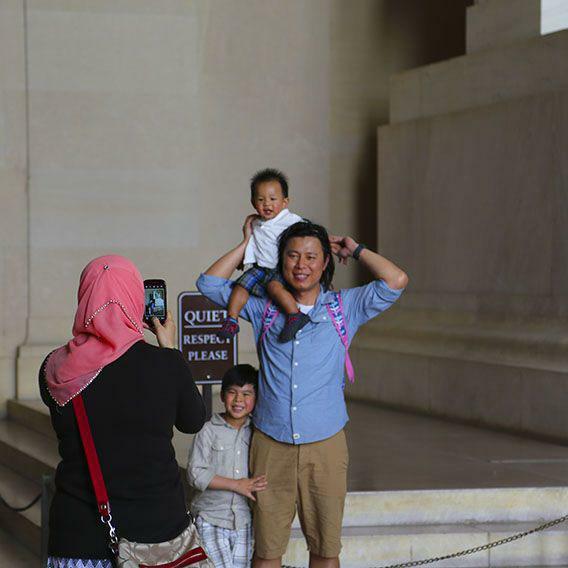 Tourists from Kuwait photograph their dad squishing the Washington Monument. I photographed one girl while she took selfies in front of the Lincoln Memorial, flicking through Instagram filters to decide which captured Lincoln in the best light. A group of middle schoolers wore matching T-shirts that read “#WashingtonDC.” As I photographed one family, dad was frustrated with my pace and decided to take pictures of me on his phone while I took pictures of him. While some tourists still stopped to read the Gettysburg Address etched into the walls of the Lincoln memorial, most stopped to raise their iPads and post it on Facebook. Two visitors to the Lincoln Memorial using their Apple Products. 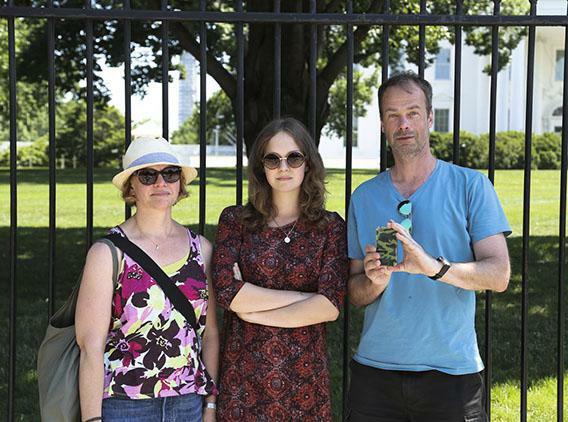 A Swedish family poses in front of the White House while the dad photographs me on his iPhone. Visiting D.C. is educational: The best museums in the world leave visitors with newfound knowledge about science, space, art, and other topics across the range of American culture. Families come here for more than an informal education for their children, however. To visit D.C. is to visit a page out of your high school history book. Standing in front of the White House or beneath the Washington Monument, there is a feeling of wonder. While I walked around the Mall talking with and photographing tourists, something about the onslaught of instant sharing and communicating, of tweeting and status updates, squashed this hallowed respect. Tourists using their cameras in the Lincoln Memorial. I found myself asking, why do tourists even come here anymore? Does D.C. remain a tourist destination only as fodder for new profile pictures? Surely there must be something more valuable than that. I set out to determine what that must be. I met people from predictable places: Pennsylvania, West Virginia, North Carolina. East Coast mostly, less than a full day’s drive away. But I also met groups from Texas and California, from Belgium and Singapore, from Bangladesh and China. I needed to know why people flew across the world to visit my city. They said they wanted to see the Capitol Building. They came for the zoo, and the free museums. 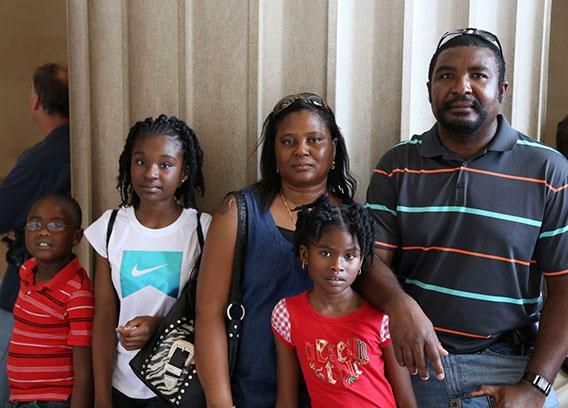 One man said he came to see “this city built as a physical representation of the evils of big government.” But other families were more insightful. 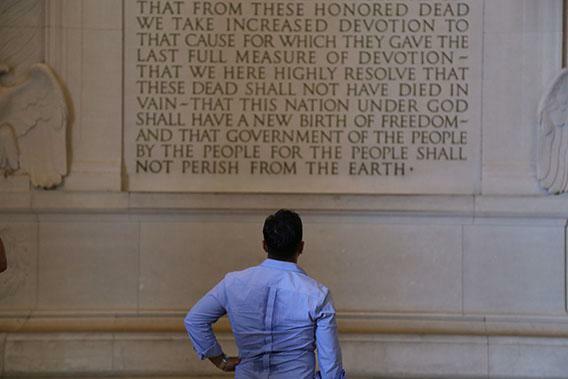 A tourist pauses in the Lincoln Memorial to read the Gettysburg Address. Sitting together on the steps of the Lincoln Memorial, wearing matching POW-MIA hats, two war veterans told me they come every summer to see what it is they fought for. A family posing in front of the reflection pool told me they were from Kuwait. The father, with his wife and two daughters, told me he wanted his girls to see a democracy in action. One family, relaxing in the grass underneath the Washington monument, stood out because of their parents’ matching Cowboy hats. I asked dad why he brought his family to D.C. Ultimately, the tourists themselves convinced me of their own worth. Despite the smartphone lens through which they now view the city, the tourist remains a valuable and misunderstood pillar of district life. Talking with tourists allowed me to see my city in a new light. 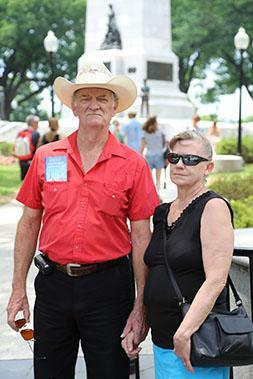 A tourist family visiting from Greenup, Ky. Sometimes it’s easy to forget that there’s more to this city than political problems. More than losing sports teams and endless traffic. While a presidential motorcade is a regular inconvenience to us, for the tourist it is a chance to be within feet of the leader of the free world. Tourists are grateful for all the things in our city to which we have grown numb. They come to Washington to relish the feeling of being a small part of something bigger. A visiting family from Missoula, Mont. So next time there’s a tourist blocking your way down the escalator, or bumping into you with their nose in a monument-map, remember why they came, and let them remind you why you’re here.